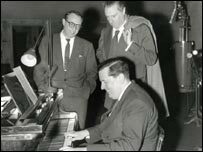 Sir Malcolm Arnold's output was prolific, including symphonies, concertos, ballet music and more than a hundred film scores. But while some regarded him as one of the pre-eminent composers of his generation, others saw him as superficial and flippant. 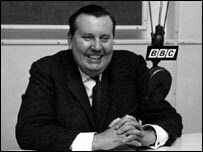 The youngest of five children from a prosperous Northampton family of shoemakers, Malcolm Arnold was a rebellious teenager who was attracted to the creative freedom of jazz. After seeing Louis Armstrong play in Bournemouth, he took up the trumpet, and at 17, won a scholarship at the Royal College of Music. By 1943, he was a principal trumpeter with the London Philharmonic Orchestra and, throughout his life, he retained a love of music for brass. Malcolm Arnold was given exemption from the armed forces during World War II, but his desire to serve became compelling after the death of his brother in the RAF. However, he was turned down by the parachute regiment and then by the Navy. When he was finally put into the infantry, he likened it to being relegated from principal trumpeter at the London Philharmonic to performing in a bus band. He ensured his return to civvy street by shooting himself in the foot. By 1943, his gifts as a composer became apparent when he wrote the overture Beckus the Dandipratt. He followed it with a horn concerto in 1945, a symphony for strings and, in 1948, a clarinet concerto. He then turned mainly to composing, his first symphony being performed in 1950. Three years later, he wrote a Coronation ballet, Homage to the Queen, which was premiered at Covent Garden. Malcolm Arnold developed a style of music that had a general appeal without being banal. His growing reputation brought him many commissions including film scores. Among them were Whistle Down the Wind, The Inn of the Sixth Happiness and the Bridge over the River Kwai. The latter won him an Oscar for his brilliant counterpoint melody to the Colonel Bogie march. 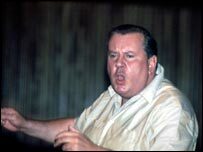 In the 1960s, following the breakdown of his marriage, Malcolm Arnold moved to Cornwall with his second wife. By the end of the 1970s though, his life degenerated into alcoholism. It ruined his second marriage. By 1978, he had written eight symphonies, but his Ninth took several years to complete. Indeed, his life might have ended too but for the loving care of a friend, Anthony Day, to whom his Ninth Symphony is dedicated. Sir Malcolm Arnold's unpretentious music was almost invariably appreciated by performers and audiences alike. He said he wanted to be remembered as an honest composer.